Saturday morning saw my two junior clients pass the six hour point of their basic course in Muay Thai for Martial Arts Cross Training. 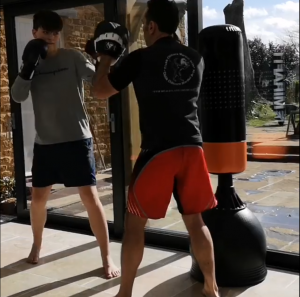 We did some coaching training in the form of pad-work order to better maintain skills outside of class and so I could also observe the training from another perspective. I also introduced another sweep and the horizontal knee strike. We began with a series of callisthenic exercises and dynamic stretching. Then we moved onto line work, looking at postures, hand positions when kicking, guards in general and balance. We went through all the basic combinations. These were then transferred onto the focus mitts, where each of the two clients took turns in holding the pads and critiquing technique. We finished on the clinch and I introduced a sweep using head manipulation off a locked-off position. This sweep is set up using a series of diagonal knee strikes. We began using the horizontal knee strike as a blocking technique.